Hooked on Needles: Fandango Cartwheels Quilt ~ Coming Along! Fandango Cartwheels Quilt ~ Coming Along! This is post number 799 here at Hooked on Needles! Do you know what that means? I think it means I had a lot to say about needlework over the past 3 1/2 years! It also means that the winner of my Fall Giveaway will be announced on my very next post, number 800! So if you haven't entered yet, click over HERE and follow the rules. They're easy, I promise! 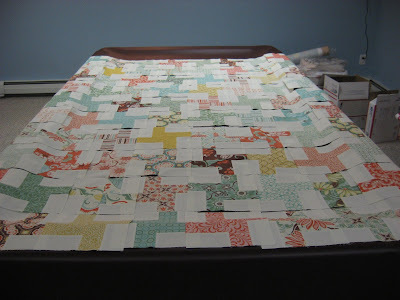 Then come back here and check out my progress on the Fandango Cartwheels quilt I've been working on...I just love it! Aren't these fabrics just fabulous? Couldn't you picture this quilt draped over the back of a cozy couch in a Florida room or covering a twin size bed in a very up-to-date girl's bedroom? 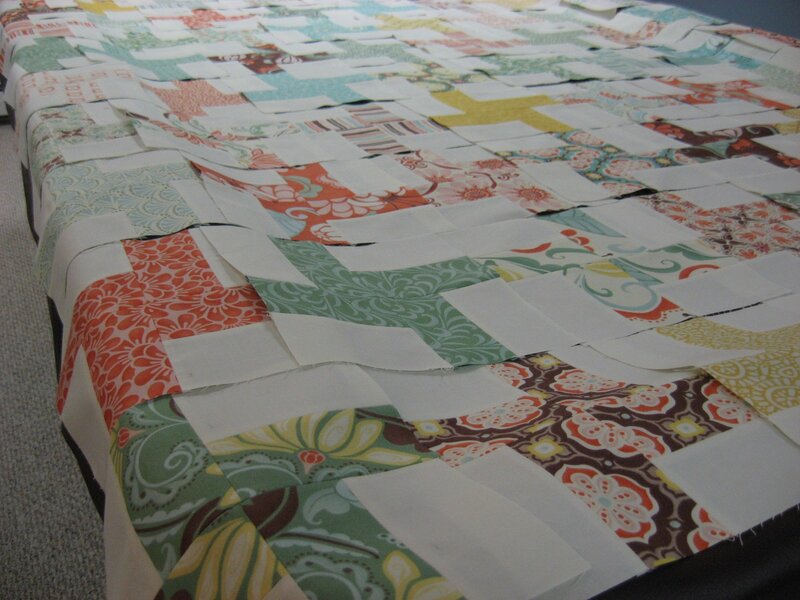 I absolutely cannot wait to get this all sewn up and loaded on the long arm machine! 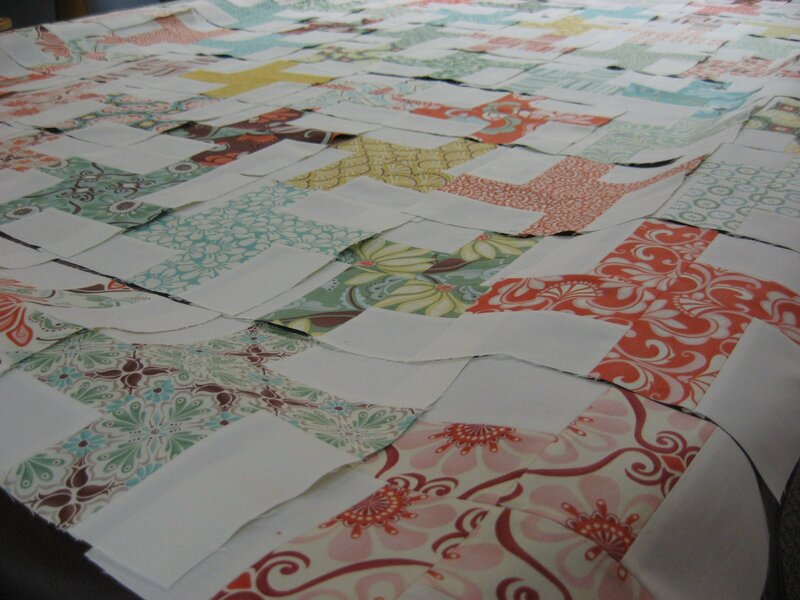 I have a nice selection of yardage to piece together for the backing, so it will be almost like a reversible quilt when it's finished! Turkey dumpling stew is almost ready, so I best be moving along. Be sure to enter my own giveaway HERE and also the one over at The Girl Creative for a chance at a $25 shopping spree in my Etsy shop. They will both be ending soon! Love it!!! Yes that fabric is fabulous!!! Yes, I love the fabrics too. 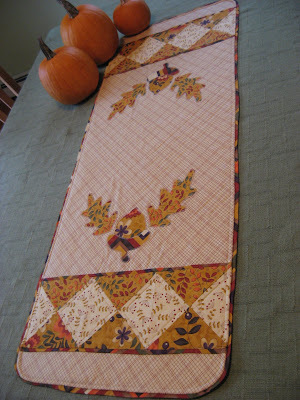 Very cute quilt. Fandango is one of my favorite fabric lines. 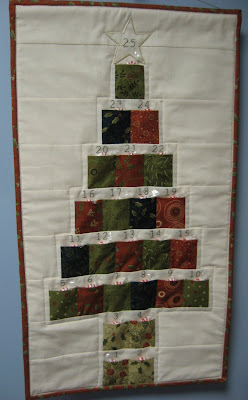 When I worked at a quilt store in St. George it flew out the door about as fast as we stocked it. Love the quilt you are making with it.